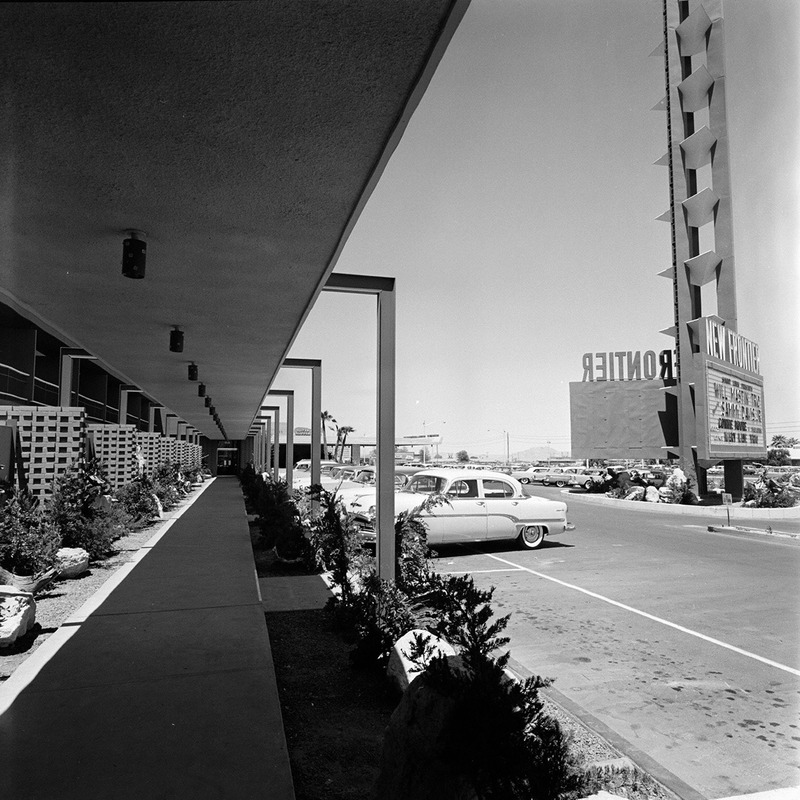 New Frontier Hotel, Las Vegas, NV, April 23 – May 6, 1956. 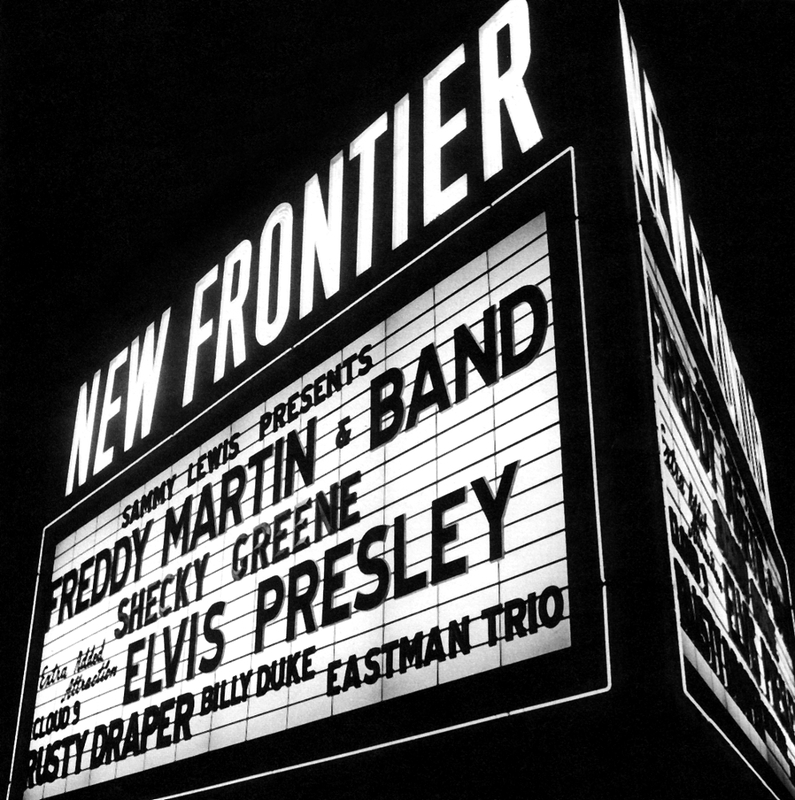 When Elvis was approached to perform at the New Frontier Hotel in Las Vegas, the manager stated that he could give him a four week booking. Drawled Southern Mr. Presley replied: “I can give you only two weeks of my time”. 2 weeks. 7 days a week. 2 sets a day. 4 songs per set. Elvis’ salary: $12.500 a week, or circa $69,44 per minute. In early 1956, Las Vegas was known for its mobbed-up glamorous guys in fedoras and ladies in white gloves. It was the era of ‘The Rat Pack’ and the nightclubs were ruled by hepcats like Frank Sinatra and Dean Martin. 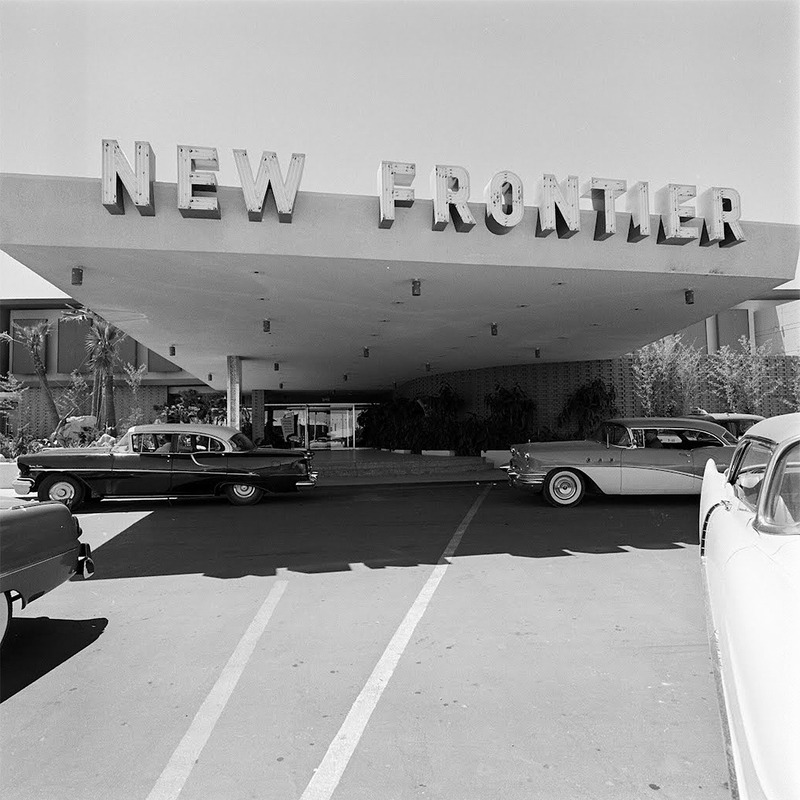 The New Frontier’s furniture was mid-century modern, the patrons were well-dressed and the food and drinks were expensive. Elvis’ first ever Vegas engagement was not a success. The Las Vegas Sun, staff report, April 21, 1956. Elvis Presley, unanimously acclaimed by critics as the most important singing find since Johnnie Ray, will open in the New Frontier Hotels’ Venus Room Monday, April 23, as a special added attraction to the Freddy Martin show. The handsome 21-year-old rock ‘n’ roller’s appearance in the latest Sammy Lewis production is considered to be the Las Vegas entertainment scoop of the year. 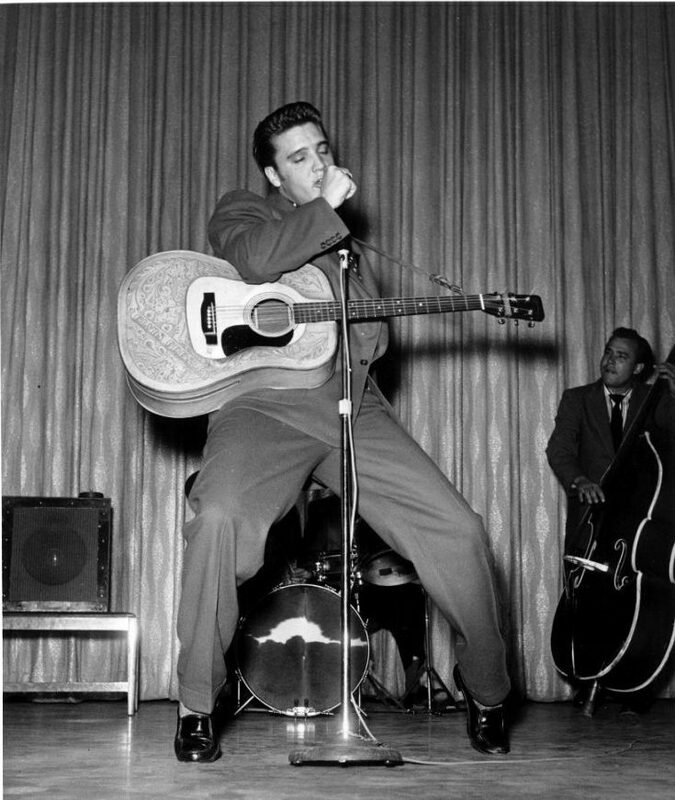 Presley’s sensational rise to fame is largely based on his recent recording of ‘Heartbreak Hotel’ which sold 100,000 copies the first week it was out and at present is nearing the 1,000,000 mark. Two years ago the young giant (he stands 6 feet 2 inches tall) was driving a truck in Memphis for $45 a week. Yet in West Coast appearances last week his unusual singing style attracted turnaway audiences of 5,000 and special police squads were needed to handle the admiring crowds who came to see America’s newest idol. Adding to Presley’s fame and fortune is a motion picture contract which he signed with Paramount Studios just this week. The young vocalist will be featured in one of the most lavish productions ever presented in the Venus Room. Freddy Martin and his band, comic Shecky Greene, the Venus Starlets and a cast of more than 60 performers will make up the entertainment package. The Las Vegas Sun, Bud Lilly (publicity director of The New Frontier Hotel), April 26, 1956. Thanks for your note requesting more info on Elvis Presley. You should know nothing makes a publicity man happier than furnishing background on one of his favorite subjects. 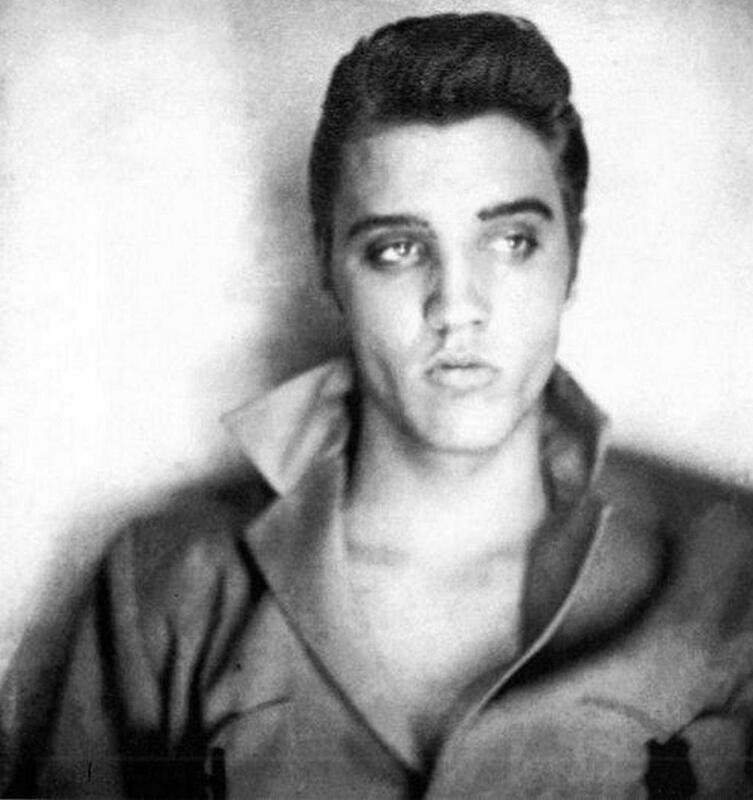 And Elvis certainly is one of my favorite subjects. Here is a nonchalant phenomenon whom, as yet, no one has accurately described. Here is a young man who has an inherent ability to arouse mass hysteria (or should I say ecstasy?) wherever he goes, yet is unassuming and completely untouched by the fabulous success he has achieved almost overnight. Wherever Elvis has appeared in the recent weeks, since he “hit”, he has left behind him tears, screams, wild applause and mangled emotions. Yet it must be a sweet agony he creates because his avid fans already have elevated him to a plane reached only by a few singers of our time. Far be it for me to analyze this handsome, 21-year-old lad whose rock ‘n’ roll rhythms brings forth squeals and cries not heard since way back when Frank Sinatra first came into his own. It has been suggested to me that Elvis Presley is a combination of Johnnie Ray and Billy Daniels, that he displays the magnetism of Sinatra and Como, that he possesses the intangible attributes of almost any two or three popular male singers you might care to group. I’ll go so far as to say I don’t agree with this. In my opinion, this boy is one to himself and doing what comes naturally. 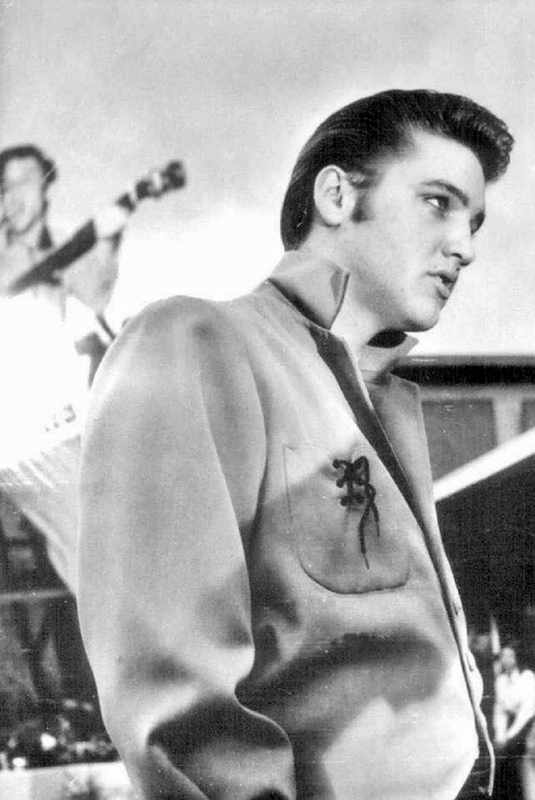 Briefly, he was born in Tupelo, Mississippi, on January 8, 1935. All his training in show business has been through self-instruction. Two years ago he was a truck driver. Last December he was signed to an RCA Victor recording contract and just two weeks ago signed to a seven-year contract with Paramount Pictures In Hollywood. Sammy Lewis, our producer here at the New Frontier Hotel says he feels this is only the beginning. And there you are! The Las Vegas Sun, Bill Willard, April 28, 1956. Accent is on pitch and pull for the batch of acts comprising the current Venus Room bill. The powers of the New Frontier are pitching the local premiere of Elvis Presley, but the pull will be in Freddy Martin’s smooth music making and word-of-mouth cheering for Shecky Greene’s unbridled comedy. 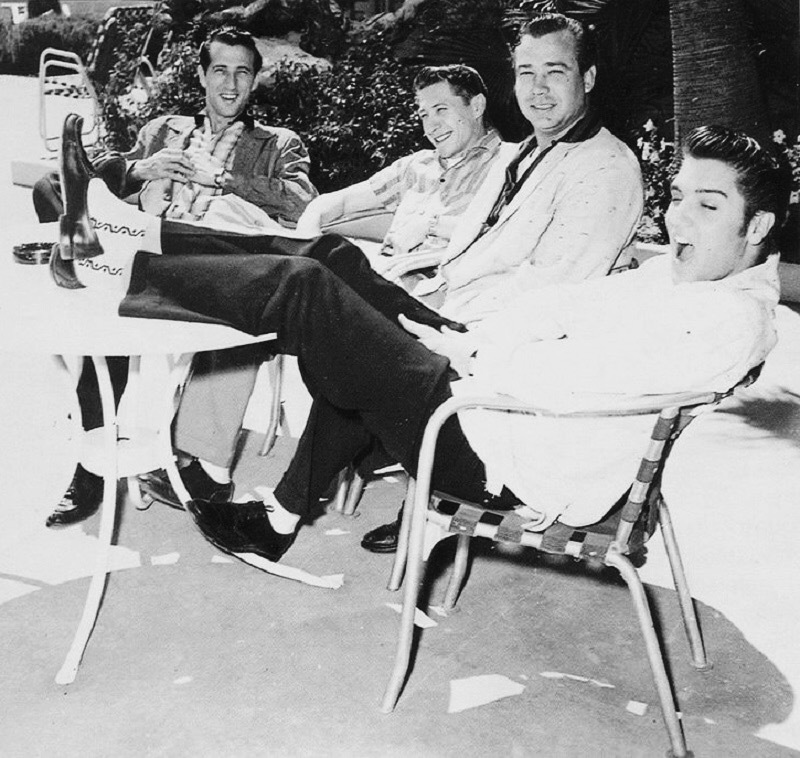 Elvis Presley, arriving here on the wave of tremendous publicity, fails to hit the promised mark in a desert isle surfeited with rock and rollers who play in shifts atop every cocktail lounge on the Strip. The brash, loud braying of his rhythm and blues catalog (and mind you, they are big hits everywhere it seems) which albeit rocketed him to the big time, is overbearing to a captive audience. In a lounge, one can up and go — fast. But in a dining room, the table sitter must stay, look and listen the thing out. Which is perhaps why Presley received applause on his opening show edged with polite inference only. For the teen-agers, the long, tall Memphis lad is a whiz; for the average Vegas spender or showgoer, a bore. His musical sound with a combo of three is uncouth, matching to a great extent the lyric content of his nonsensical songs. It was decided that a special matinee performance would be staged for young people, who would be charged a dollar apiece to drink Coke and listen to Elvis, with all the proceeds going towards a $35,000 fund being raised for a baseball park. Elvis was to sing without fee. The hotel agreed to provide its ornate banquet room and the refreshments without cost. All went well until Elvis made his entrance overlooking his audience of 700, mostly young girls. “I’m sure glad to see you all”, he said, “because ordinarily the hotel doesn’t allow anyone in here under eighteen unless they bring their own whiskey”. There were peals of laughter and the kids threw themselves into listening to Elvis as strongly as he threw himself into his singing. He did fifteen songs before the fun really started. After he went off stage the girls started hunting for him, through all the halls, banging on room doors and calling to him. It was late in the evening before the girls were finally all captured and sent home. The Las Vegas Sun, Ralph Pearl, May 1, 1956. The Shake and Shiver Kid. Now that I have finally found out what an Elvis Presley really is, I wonder if I will ever be happy again. You see, a Elvis Presley is an intense young singer who opened at the New Frontier a week ago with a very nervous guitar. And though the lad probably has yet to experience his first shave, he and his trio of instrumentalists have already sold a million records of their first recording. Presley sings and I try to recall Burl Ives, Harry Belafonte and Johnny Ray. Mind you now, I’m not saying he compares with either of the illustrious gentlemen named. However, he doesn’t sound too unlike those lads. So there stands Elvis Presley, who probably has yet to blow out his 21st birthday candles, drink his first beer or kiss his first girl, the absolute rage of the juke box business and several million youngsters who compare him to the great in this unique field of hysterical rock ‘n’ roll rhythm. And as he stands up there clutching his guitar, he shakes and shivers like he is suffering from itchy underwear and hot shoes. There is no doubt, I say to myself, because my wife seems to be pretty much interested in Presley’s gymnastics on stage, this is the beginning of another craze. And a cold sweat pops out on my forehead as I full realize that my missus is now on the brink of a shopping spree for Presley records. 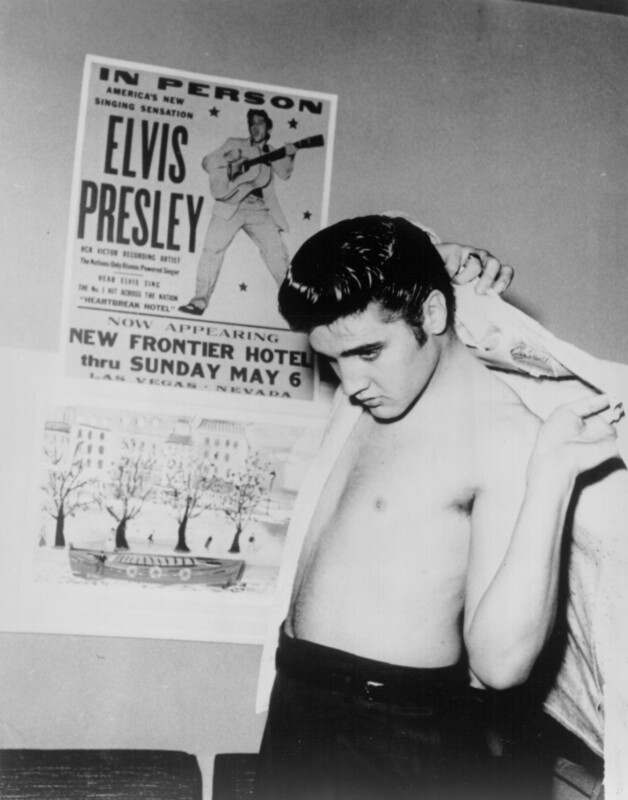 Seriously, however, I’d like to see this Presley in a hotel lounge. He would probably be the nearest threat to Louis Prima the two years that Luigi has dominated Vegas lounge entertainment. However, I don’t imagine Presley’s board of strategy is listening to the weak chirpings of lounge talent buyers. Especially when millions of youngsters, who buy Presley’s records, are forming long lines outside of the music shops of America and Canada. Yes siree, the lad with the sleepy eyes and angry fingers on his electric guitar may crave a steady diet of fried pork chops, but the youngsters also crave a steady diet of Elvis Presley. And right now the lad is hotter than a cauldron of boiling oil. What is his favorite tune, you ask? That is easy. It’s the sound of the hard and shiny cash registers which have his name on them. The Las Vegas Sun, a ‘letter to the editor’ by Ed Jameson, May 12, 1956. I will try to bravely carry on after reading the report of the Sun’s police reporter concerning Mr. Elvis Presley now holding forth at the Venus Room of the Hotel New Frontier. I’m not after the teen-age vote or to sell Portia’s pound of flesh. I come not to bury Caesar, but to praise him. It is a weakness of the mind to preconceive a judgment of your thought before the act is done. Despite the acid hemlock broth stirred by the Sun’s copy boy methinks Mr. Presley will survive and live to sing some more. Not that for many moons to come his name will be well known about the countryside. Perhaps this cat should have studied grand opera, the fiddle or just be satisfied herding a truck. I don’t join that school of thought. He’s happy and he’s making lots of other people happy doing just what he is doing naturally. You see, he’s a natural. Any dope knows what a natural is. This cat Presley is neat, well gassed and has the heart. His vocal is real and he has yet to go for an open field. He is hep to the motion of sound with a retort that is tremendous. The squares who like to detract their imagined misvalues can only size a note creeping upstairs after dark. This cat can throw ’em downstairs or even out the window. He has it! Presley has a depth of tone that can sink deeper than a well. He can wilt into a whisper faster than a gossipmonger can throw down a free drink. He is classier than a new sock and a skinner on the strings. He really makes them cry. He’s a smooth cast, cool and crazy with new stuff. His sound is dreamy and unique, loaded with mystery. So settle down dad. Take your cow straight. Wipe the blood out of your eye. I still got your coat. Music shines in anything that sounds. Youth is an exuberant stage of life with the top down. Presley’s voice is that of American youth looking at the moon and wondering how long it will take to get there. He is not a Rock ‘n’ Roller nor is he a cowboy singer. He is something new coming over the horizon all by himself and he deserves his ever-growing audience. Nobody should miss him. Parents would do well to take their children to hear him. It would be a good way to get to know and understand your own kids. Yep, this boy’s sails are set and he’s got wind. Good luck boy and the best of everything. I hope they hold you over! After all ten million cats can’t be wrong. 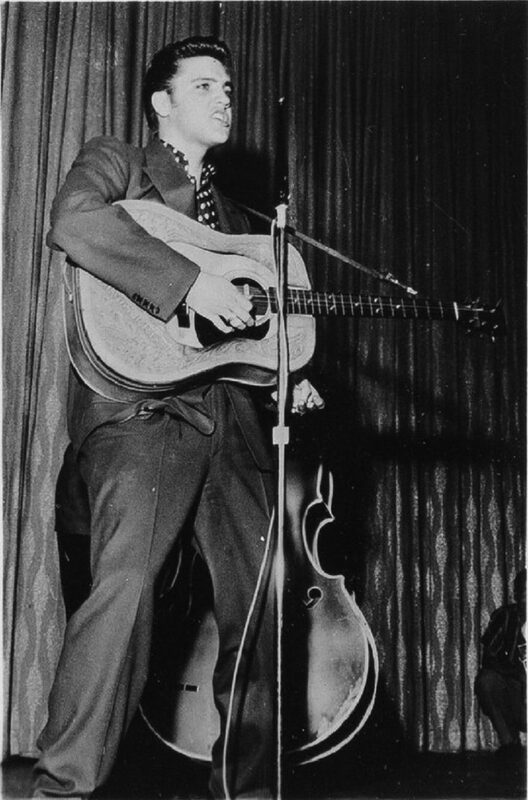 Around the time when Elvis made his Las Vegas debut in April 1956, the 21-year-old marvel from Memphis was driving a wedge between the generations with ‘Heartbreak Hotel’. 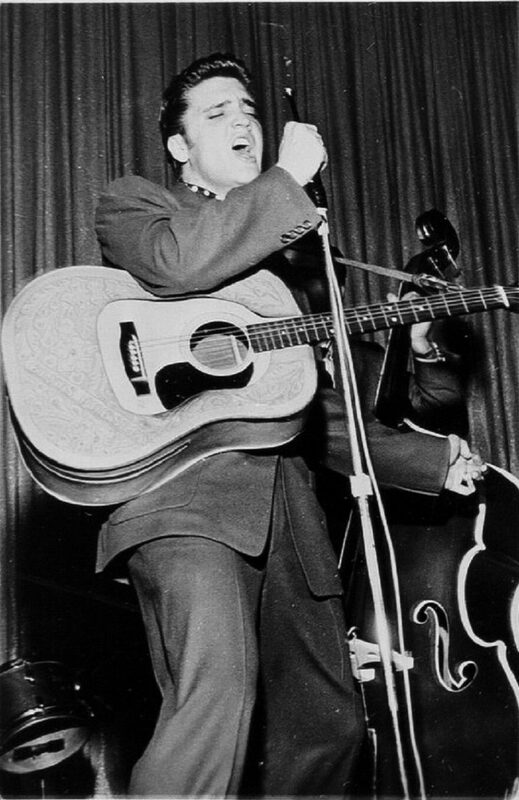 The booking at the New Frontier was an attempt by his manager, Colonel Tom Parker, to break Elvis out of the Southern honky­tonk and state-fair circuit and give him national credibility. 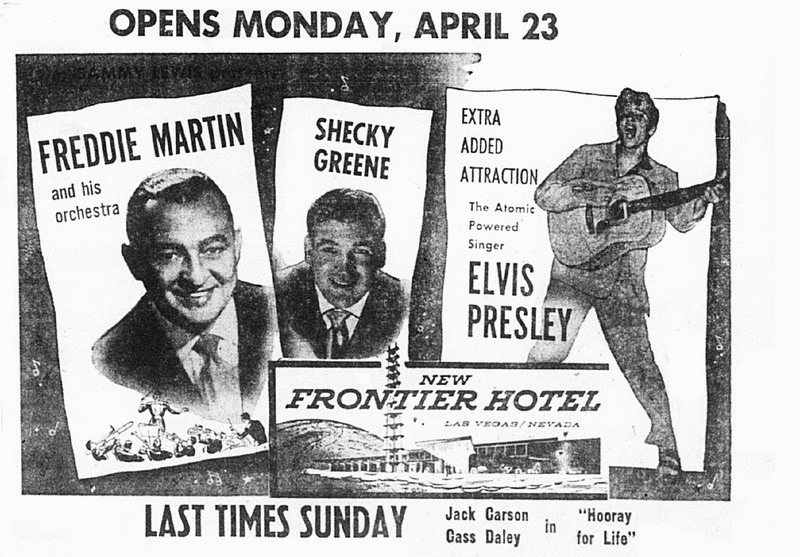 Elvis was billed in newspaper ads as “The Atomic Powered Singer” and an “extra added attraction” to Freddy Martin and His Orchestra and comedian Shecky Greene at the Strip hotel. But on opening night “Elvis went down like a jug of corn liquor at a champagne party”, according to Newsweek. 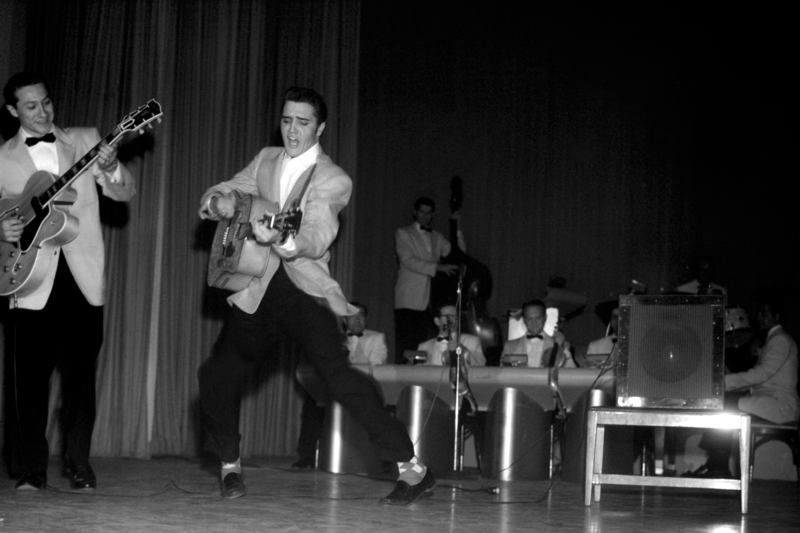 “I don’t think the people there were ready for Elvis”, drummer DJ Fontana would later say of the Vegas audiences. “We tried everything we knew. Usually Elvis could get them on his side. It didn’t work that time”. 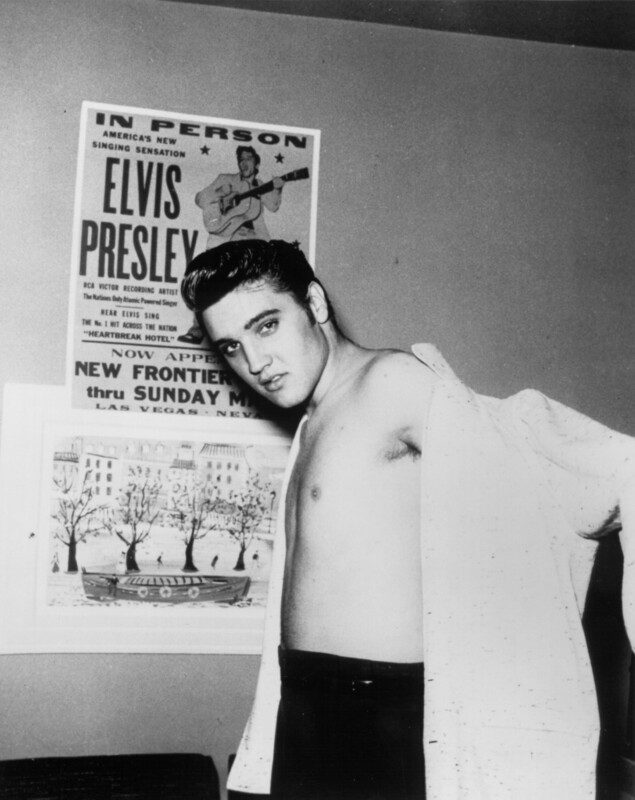 Robert Johnson, a writer for Presley’s hometown Press-Scimitar, had come to the desert to report on the Vegas debut of Memphis’ favorite son. Even Johnson had to admit that Presley was out of his element on the showroom stage. 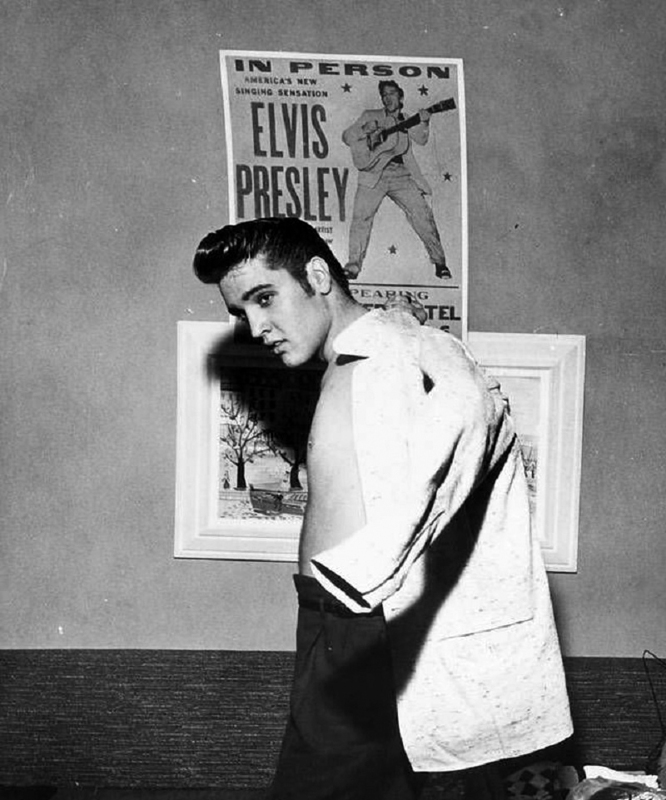 “In the New Frontier’s plush salon, Elvis faced a different kind of audience”, Johnson observed in his May 4 Press-Scimitar exposé on Elvis, “super-critical, sophisticated, wondering boredly what this youngster had which is so hot. There were no screams, no frantic shouts to herald his entrance. Just cold silence, surmounted by the inevitable hum present wherever alcohol is used internally”. “He was weird looking for those people”, recalls singer Freddie Bell, performing at the Sands at the time. “He had that hair, and sideburns”. Indeed. And he was singing rock ‘n’ roll, in Sinatra-town. Las Vegas News Bureau photographer Jerry Abbott recalls opening night: “I shot one roll of film on him and thought “This is going nowhere”. I then decided to use the rest of my film on Shecky Greene the comedian”. Flopping in Vegas had Elvis Presley singing the blues. “I don’t want no more nightclubs”, he fumed to the press after one performance. “An audience like this don’t show their appreciation the same way. They’re eating when I come on”. 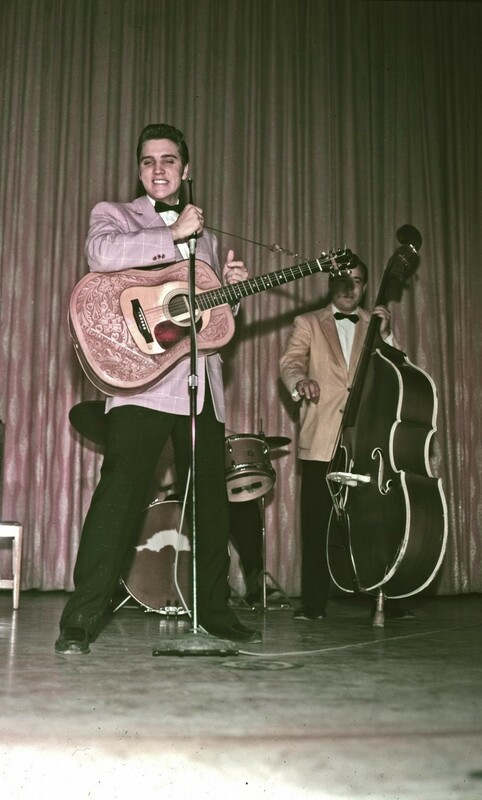 Each night, Elvis appeared at the end of the show, after an exhausting parade of over 50 performers. His 4-piece sound stood in sharp contrast to the big band extravaganza of the Freddy Martin Orchestra and the music-hall comedy of the previous acts. 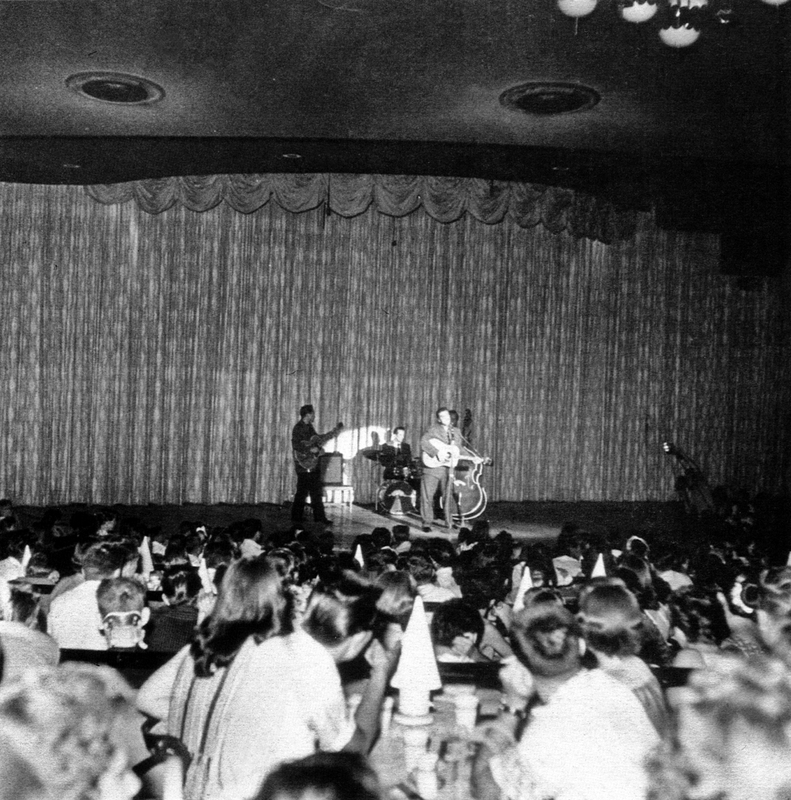 Elvis’ act appealed to a youthful audience crowding a bandstand, and not to a plush dining hall full of Vegas sophisticates. The audience watched in bemused silence, they clapped politely while sipping their cocktails. It was simply a case of the wrong act, pitched to the wrong crowd, at the wrong time. But, apart from a very bruised ego, Elvis did not exactly leave the Nevada desert empty-handed! 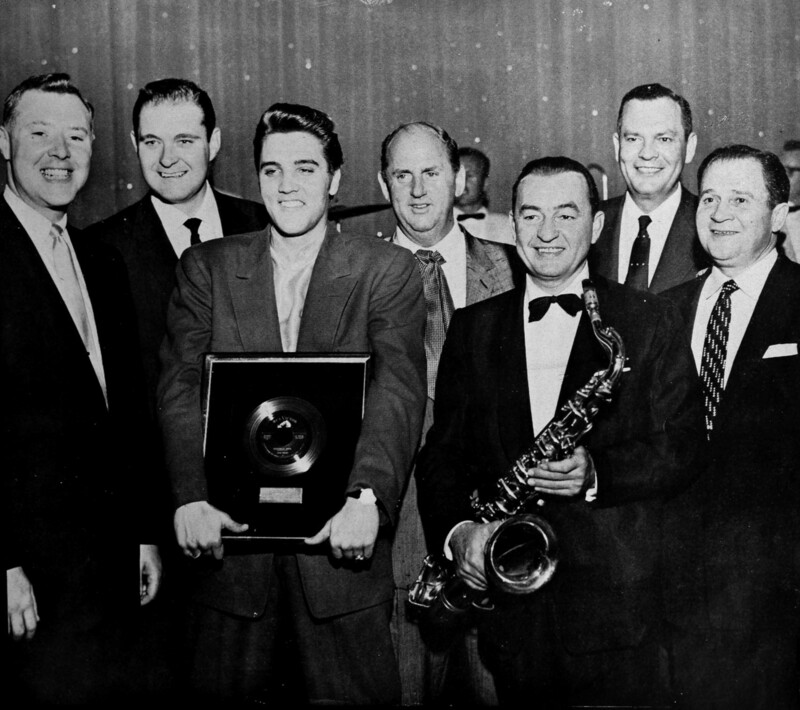 While in Vegas, a milestone in Elvis’ career occurred when he revealed his first gold record for ‘Heartbreak Hotel’. The photo to the right was taken on stage at the New Frontier. The gentleman with the saxophone, is band leader Freddy Martin. And during his Vegas stay, Elvis had caught Freddie Bell’s show at the Sands Hotel. 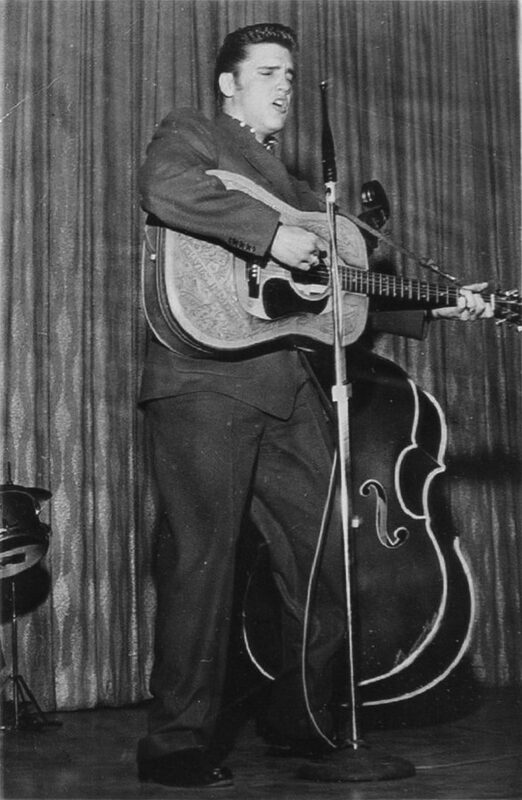 According to Bell, Elvis was so impressed by Bell’s toned-down version of Big Mama Thornton’s Hound Dog, that he gave the Colonel a copy of the single that had been a regional hit for him. 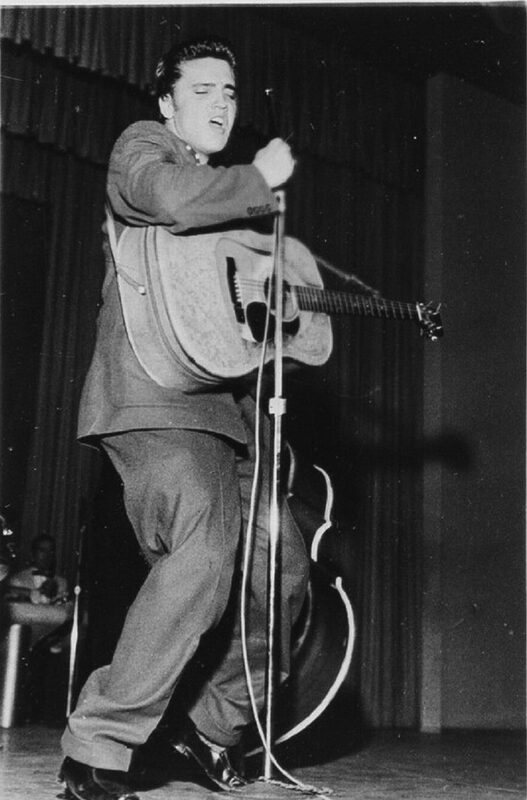 Bell hoped that if Elvis recorded it, he might benefit from it. While few people today have heard Bell’s recording, Elvis’ version of ‘Hound Dog’ would become one of rock’s most memorable anthems. Good reading. Wrong time, wrong place, wrong audience – but the storm was coming !! Excellent article. This move wasn’t half as bad as history would have us believe. It came at a time when it didn’t really hurt much. Had it been a year later that might have been different. Parker made mistakes, but he also made many, many good deals. One of the reasons we’re still debating it after all these years. Enjoyed this posting. Elvis recognized what was going on during this engagement, but he and his band made light fun of it, even on stage during performance. Elvis’ manager, Colonel Parker, made a lot of mistakes during Elvis’ career, but so did Elvis. The thing about all this, Elvis maintained Colonel Parker as his manager until his untimely death on Aug. 16, 1977.